I was reading a blog of a friend of mine, Dave Stoker, over at Thoughts of a Seeker when I noticed a photograph of a statue he used in a post. This statue, that he identified as the Tian Tan Buddha, was intriguing to me because of its unique posture that I had not before recognized in Eastern art. Dave informs us that these arm and hand gestures are quite universal in historical depictions of Buddha, and are known as mudras. 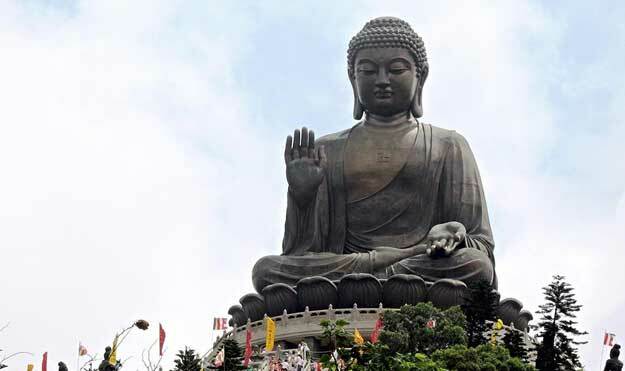 He further says that this particular statue is the largest outdoor seated Buddha in the world, completed in 1993 in Hong Kong.
. . . this mudra symbolizes protection, peace, and the dispelling of fear. It is made with the right hand raised to shoulder height, the arm crooked, the palm of the hand facing outward, and the fingers upright and joined . . . 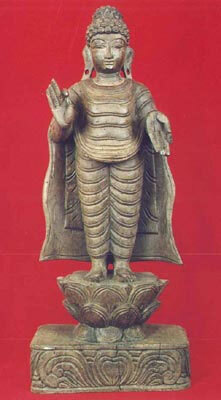 It is also noted that this mudra is the “accomplishment of the wish to devote oneself to human salvation”10. This mudra is rarely used alone, but is almost always accompanied by a mudra of the right hand, most often the Abhaya mudra11. As Hugh Nibley has noted, these type of practices are “not for a moment to be equated with the true and celestial order of things,” but “we may be able to learn much from [them]”14. I have been searching the web for three hours, trying to find out what the symbol is on the palms of the Tian Tan Buddha statue. While I can find many, many links to articles, postings, blogs, etc., which reference the Tian Tan Buddha and symbols of Buddhism, all omit what would be to me the most interesting information, i.e. ; the symbol in the center of palms of the Tian Tan statue–how weird is that??? People note the svastika on the chest, the third eye, etc., etc., — Has no one noticed the symbol in the palm of the hand? It’s hard to see the symbol on the palms. Do you have a photograph you could share? Could the symbol be related to the hand with a wheel symbol in Jainism? I think the photo (actually a drawing I think) is here. I’m not sure if it is the same as the wheel in Jainism or not. Wow–you found the drawing, and yes, it is a graphite drawing. I guess we’ll never know what the symbol is on Buddha’s palms??? I’ve thought of phoning a Buddhist monastery to see if they know. Thanks for your interest, and, one great thing for me is that this dialog about Buddha’s palms led me to discover Jainism. Not for religious reasons; it’s just fascinating to learn about the evolution of cultures. The symbol in the hand is the karmic wheel (you can see a picture here. There are 8 pegs that represent the Noble 8-fold Path of Buddhism, by which you turn your own wheel of karma according to your actions. I learned this by attending lectures and ceremonies at a local monastery. That is also where I first came across images of the mudras on a wall in one of the shrine rooms, which was devoted to honoring the lineage of patriarchs of their particular sect of Buddhism (Wei-yang). BTW, I started visiting this monastery because I realized one day that I had biases against Buddhism and they were based entirely on hearsay (mostly from fearful, misunderstanding Christians), the same way they get all their information about us Mormons, and I didn’t want to do the same thing to others. I learned so much from the classes, free books, and conversations, that I now have a deep love of Buddhism. I highly recommend the experience. Note: Buddhism is as diverse as Christianity. I attended a branch of the Dharma Realm Buddhist Association, which practices zen. They are very humble and sincere people. Of all forms of Buddhism I have come across, Mahayana will probably be the most familiar to Mormons, doctrinally. You may be surprised how many things are similar to the True Gospel.